I have my favorite ice tea glass and I had three of them left. Well in the last three days two of them have been broken. I went looking online for them to discover not only are they not made anymore, but they are considered vintage and the only way to get more is on E-bay for $49.95 for two of them. You can bet that I will be guarding the last one with my life. 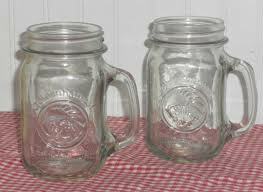 Not only that but it is time to haunt second hand stores looking for Golden Harvest Mason Jar Mugs.